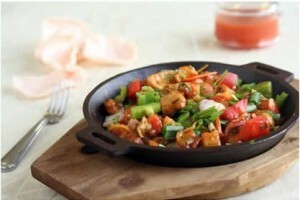 Chicken Shashlic recipe by Mahirah Ali at DesiRecipes.com. Marinate chicken in soya sauce, ginger n garlic paste n salt n pepper for an hour. Heat oil in a pan put the chiken and tomatoes in it n cook. then add tomato sauce and chilli sauce. bring to a boil untill the chicken turns tender. cudnt be more worse than this!